This headrest is from the Luba people, a Bantu-speaking group who live in south central Democratic Republic of the Congo. Headrests are popular throughout Central Africa as well as in other parts of the world. They keep the owners’ hairstyles from being ruined while they sleep. For the Luba, headrests are more frequently used by royalty, as their hair is more elaborately styled than the lower classes. 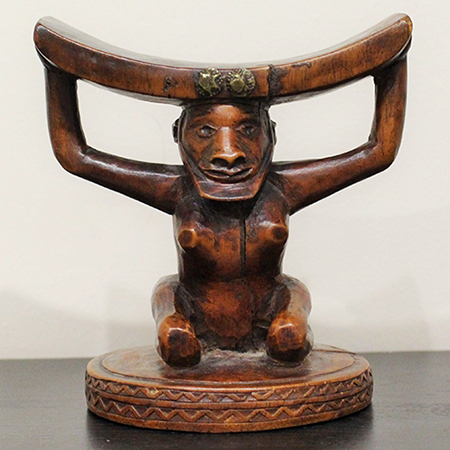 The support structure of this headrest features a kneeling woman. Luba artists use representations of female figure in all kinds of sculpture to honor the important role of women in their society. This headrest is currently on display in Escape the Museum: Central Africa, which will be on exhibit through August 18, 2018.